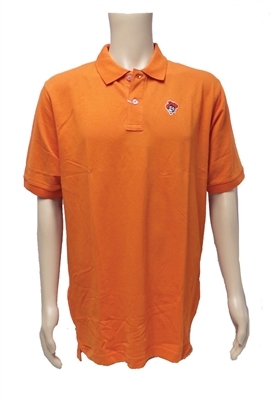 This Chris' EXCLUSIVE Orange & Black Label polo by Vantage is a classic. Pistol Pete's head is embroidered on this top-shelf pique polo. 100% combed cotton (97% cotton/3% spandex), 5½ oz., solid stretch pique body, solid rib-knit collar and cuff, two-button applied placket, polished buttons, double-needle top-stitching, inner locker patch with tagless neck label, two-toned striped piping in neck, dropped-tail bottom with side vents. Imported.